One of the Adirondack Mountain Club's (ADK) first major projects was the construction of the Northville-Placid Trail in 1923. 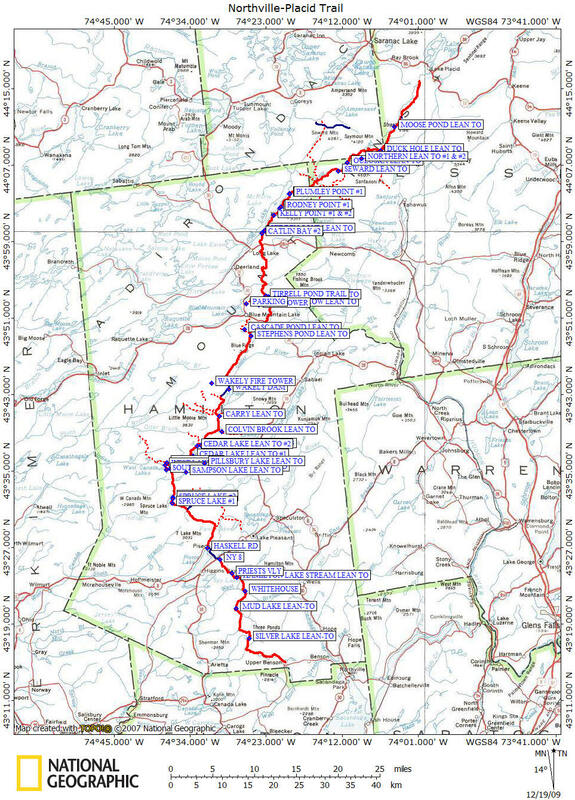 The trail currently runs from Northville in the southern Adirondacks to Averyville in the High Peaks Wilderness region, just outside Lake Placid. The trail travels through lake country and mostly avoids mountains during the whole stretch of the trail. The single highest point of the trail is at 3008 feet, just south of Long Lake, which features a 1200 foot ascent & descent over a ridge. The kiosk in Northville states that the trail is 135 miles long. Our mileage has the trail 127.6 miles from the Northville Kiosk to Averyville Road. The trail looks easy on a map, but there are many that have failed a thru hike attempt of the NPT. Most hikers don't realize how remote some of the sections are and how difficult it can be to get supplies. The biggest reasons for failure include not giving yourself enough time to finish and not properly prepared with food & water supplies. Biting insect season will also put a damper on your adventure. There are many reroutes along the way, most due to beaver activity, but the trail is generally very clearly marked with DEC blue plastic discs. You will have new feelings on the way you look at beavers after hiking this trail. Be very wary if you decide to walk through a beaver pond, you could find yourself waist deep in mud in the middle of the wilderness. There are also new sections of the trail being built to eliminate the current road walks in certain parts of the trail. Check the NY DEC Adirondack Trail Information for updated trail conditions, before solely using the info on this website. Officially the southern start of the Northville-Placid Trail is located in the small hamlet of Northville and ends in Lake Placid. The start of the trail includes a road walk, although a new reroute has taken the trail off road in the Northville area. Most through hikers plan 8-10 days to complete the trail. You should give yourself at least 14 days to complete the whole trail. There are USPS offices available for mail drops in Piseco, Blue Mountain Lake and Long Lake that are somewhat close to the trail. The Lake Durant State Campground is also along the trail. The hamlets of Blue Mountain Lake and Long Lake are also popular "rejuvenating" stops. Be wary of summer/fall weekends when looking for a place for the night in each of these locations. In 2009 a new six mile section of trail was completed that took the trail off the old McCanes Resort on Cedar River Road and into the woods. We still find thru hikers walking Cedar River Road, unaware of this reroute, missing the turn. On a trip to Sprague Pond, I found two thru hikers who thought they were on the NPT and were looking for the trail out of the pond. Be sure to be fully prepared and updated before attempting this trail. Be sure to follow the blue NPT plastic discs and in some circumstances even red flagging tape over new reroutes. In 2011 the landscape along the NPT changed for ever after a Tropical Storm destroyed the dam at Duck Hole, which drained the beautiful pond. In 2013 a new reroute was opened that took the trail away from Upper Benson and past the scenic Woods Lake. Another reroute in the southern section of the NPT has taken the trail completely off Benson Road. This reroute was completed in late September 2015. Although most thru hikers do the Northville-Placid Trail in a northerly direction. We suggest that you start from Averyville Road near Lake Placid and travel south to Northville. The southern terminus is at Waterfront Park, which features a nice wooden arch, a kiosk and designated parking for NPT hikers. Plus there is a restaurant/bar right next to the wooden arch. A nice way to finish your NPT adventure. We recommend that you purchase the Northville-Placid Trail (National Geographic Trails Illustrated Map) to help plan your Northville-Placid Trail adventure. (c) 2006-today CNY Hiking - All rights reserved. Any use of information from this site without permission is strictly forbidden.